The campsite has direct access to the Dordogne river, so make the most of the sandy and pebbled beaches to fish or go for a refreshing swim. When you come to the Dordogne, you can’t not go canoeing. Canoe down the Dordogne in your own time, admiring the beautiful surroundings. From your canoe, in the middle of pristine natural surroundings, drift past Castelnaud and Beynac castles that overlook the cliffs. You may prefer a trip on a Gabarre barge, perfect reproductions of those that brought travellers and goods to Bordeaux back in the time. Depart directly from the campsite on bike rides and hikes. 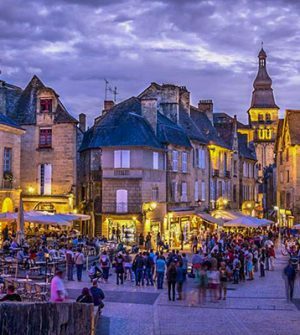 The 8 km-long Monfort loop will take you via Vitrac and its church, and to the medieval town of Montfort, set on its rocky outcrop overlooking the Dordogne. 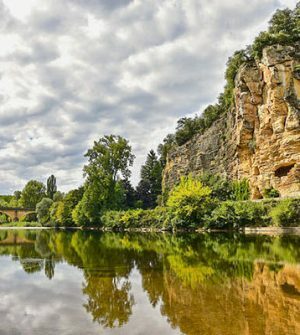 Prolong your trek towards Le Port in Vitrac , with its impressive yellow stone bridge, arching over the Dordogne river, taking you to the opposite shore of the Vitrac beach. The 7 km Marobert loop. Choosing this loop will take you to Le Bourg in Vitrac. After a short detour, you’ll be able to prolong your trip towards the port where you’ll learn about the legend of the bells and the “Drac”, a legendary Dordogne river creature from the Périgord region. If you want to have some water fun, cross the Vitrac bridge, and you’ll arrive on Vitrac beach where you’ll find a nautical stopover. If you love heights, climb into a hot air balloon to discover the extraordinary landscape and the magnificent Beynac, Castelnaud and Les Milandes castles. An unforgettable experience and wonderful memories to take back!